The Regiment was first raised as Colonel George Villiers’ Regiment, one of the six regiments of Marines raised for sea service in 1702. They were intended to furnish landing parties and to provide small arms fire for close-quarter fighting in sea battles. The Regiment was immediately in action when, after an unsuccessful attempt to capture Cadiz, it was landed at Vigo Bay in October 1702, captured the fort of Redondella and re-embarked with a considerable amount of plunder taken from the Spanish treasure ships. A Regiment at that time normally took its name from the Colonel, and it was as Luttrell’s Marines that the Regiment took part in the capture of Gibraltar in July 1704. The Rock was soon besieged by 8,000 Spanish and 4,000 French troops. The garrison, although heavily outnumbered, resisted desperately until the siege was raised in April 1705. For the part played by Luttrell’s Marines in the capture and subsequent defence of the Rock, the battle honour ‘Gibraltar, 1704-5’ was awarded. Once there were sufficient troops in Gibraltar to garrison the fortress, the Marines were re-embarked and took part in the capture of Barcelona in September 1705; then in the first half of 1706 the Regiment captured a number of towns, including Alicante, on the east coast of Spain. The Fleet sailed home in October, and, sadly, part of the Regiment was lost by shipwreck off the Scilly Isles. The Regiment then continued to serve in the traditional Marine role ‘By Sea and by Land’, their principal action being the capture of Cagliari, the capital of Sardinia, in August 1708. In March 1711, Colonel Sir Harry Goring became Colonel of the Regiment. When the War ended in 1714, there were, as usual, reductions in the Armed Forces, and the Regiment was threatened with disbandment. In consideration of its, distinguished service in the Mediterranean, however, Goring’s Marine Regiment was retained, and became after twelve years active service in the Marine Corps, Infantry of the Line, and was numbered the 31st Regiment of Foot. Between 1715 and 1739 there was uneasy peace in Europe, and the Regiment spent much of this time in Ireland where religious differences already continued to cause unrest. The next major war, that of the Austrian Succession, began in 1740. The Regiment was with the Army under King George II at Dettingen and, this was the last occasion on which a King of England commanded his Army in battle. At dawn on 27th June 1743, the Army was virtually encircled in a narrow defile with the River Main on one side and steeply wooded slopes on the other. The French forces were in great strength in front and to the rear. However, their plan of attack was upset by an impetuous charge by their cavalry, and the British then counter-attacked, forcing the enemy to retire across the Main with heavy losses. During the fighting, the King, misled by the buff facings of the 31st, called out, ‘Bravo, Buffs’, whereupon one of the officers said, ‘Sir, we are the 31st, not the Old Buffs’. The King replied, ‘Then bravo, Young Buffs’, a title thereafter valued by the Regiment as a reminder of the occasion on which it had been received. The next major battle was the glorious failure of Fontenoy two years later. Here the British were forced to retire after losing more than 7,000 in dead and wounded. The Grenadier company of the 31st came out of action with less than a dozen men. The Army then left the Continent in order to deal with the Jacobite Rebellion of 1745, but the 31st, well below strength after Fontenoy, were sent to form part of the London garrison. 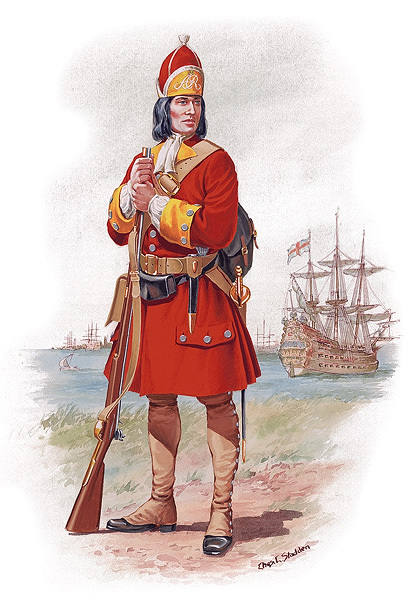 After the War, while the 31st were in Minorca, the Royal Warrant of 1st July 1751 standardized uniforms and the design of Colours for the whole Army. The facings of the 31st were confirmed as buff, and so the nickname of ‘Young Buffs’ remained. In the following year the Regiment was sent to Scotland for a seven year posting, and while stationed in Glasgow in 1756 was ordered to raise a 2nd Battalion. Two years later this battalion was constituted a regiment and became independent as the 70th Regiment of Foot. It was originally known as ‘the Glasgow Greys’ from the colour of their grey facings, but in 1768 the 70th adopted the distinctive black facings which it wore until 1881. In this year the 70th amalgamated with its parent regiment, the 31st, to form The East Surrey Regiment. In 1765, after further service in England, the 31st were sent to the West Indies, that graveyard of so many fine regiments. Yellow fever contracted in Jamaica accompanied the Regiment to Florida and caused a terrible loss of life. on one occasion the Regiment was reduced to one corporal and six private soldiers fit for duty. In 1772, the 31st were ordered to St Vincent to deal with a local insurrection, described as extremely desperate and bloody’. After a year’s savage fighting in the woods and mountains of the Island, the 31st were relieved and returned to Scotland, and their old quarters in Glasgow. The service of the newly formed 70th Regiment at this time was similar. Between the years 1763 and 1773, it too was in the West Indies, suffering from the ravages of yellow fever in Grenada. It was called upon to provide detachments to reinforce the expedition to St Vincent in which the 31st were already engaged. The 70th, too, were sent home, and like the 31st were once more stationed in Scotland.